Traditional tape or disk backup used to be the best option for small- to medium-sized businesses to back up data. Today, methods of business continuity and/or disaster recovery previously only available to large businesses are now available to all-sized businesses at affordable prices. These solutions are easier to manage, more reliable and can save your company from losing vital data and experiencing costly downtime. 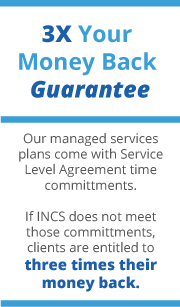 In addition to our backup/ business continuity and disaster recovery solution, INCS has partnered with industry-leading solution providers exclusively for Windows servers. These solutions provide hourly data backup, drastically reducing the potential data loss in the event of an outage. In the event of a restore, the worst your staff would be required to re-enter is one hour of work rather than an entire day’s worth. Additionally, downtime is reduced to mere hours instead of days needed to replace hardware and restore from tape or local hard drive. We offer secure, proven solutions that can be configured to fit your business and scaled to fit your budget. Watch a video on Instant Virtualization below.